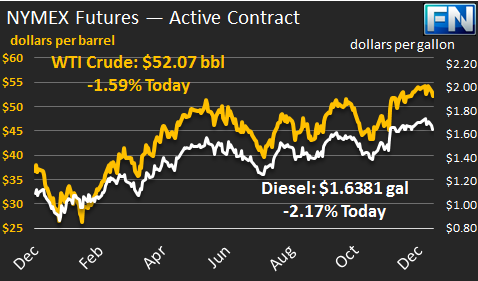 WTI crude prices continued to slide yesterday, and prices are having a difficult time clinging to $52/b this morning. WTI opened at $51.83/b today, $1.92/b below yesterday’s opening price, and the lowest opening price since December 16th. 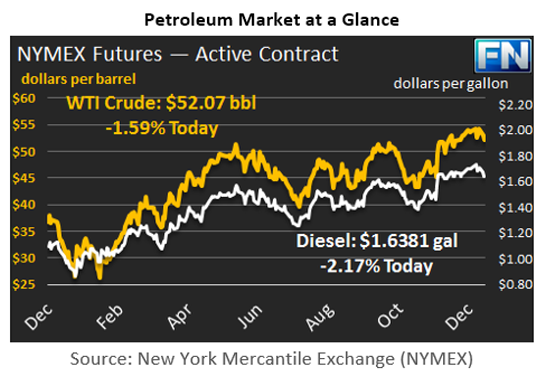 Current prices are $52.07/b, $0.11 above yesterday’s close. Product prices also dropped steeply, following crude prices. Last week, prices surged to eighteen-month highs during heavy buying after the New Year’s holiday weekend. The market this week is rethinking the price surge as too much too soon. Although there are indications that OPEC countries are taking their assigned production cuts seriously, hard numbers are scarce. OPEC will publish January numbers in February, and in the meantime, traders essentially are looking at market prices to tell them where supply is, rather than using supply to determine appropriate prices. It is a bit like looking at prices to tell where prices are—an uncomfortable position for technically oriented market analysts and economists. Supplies appear more than sufficient to meet demand. The U.S. active rig count increased by 7 rigs last week. This was the eighth week in a row that the U.S. rig count increased. In December, U.S. crude production rose by 73 kbpd. Oil is also moving into the markets from storage. Reuters reported that Iran has sold over 13 million barrels of oil from floating storage. A sale of approximately 8 million barrels of oil from the U.S. Strategic Petroleum Reserve is possible this month also. Distillate opened at $1.6379/gallon in today’s session. This was a major drop of 6.32 cents from yesterday’s opening price. Current prices are $1.6381/gallon, a minuscule 0.005 cents up yesterday’s close. RBOB opened at $1.5698/gallon today, down 5.99 cents from yesterday’s opening. RBOB prices have weakened for the past three sessions. Yesterday’s closing price was $1.5707/gallon. RBOB prices are currently $1.5786/gallon, 0.79 cents above yesterday’s close.